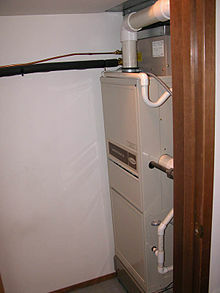 A furnace room is a room in a building for locating a furnace and auxiliary equipment. Such a room minimizes the visual impact of the furnace, pipes and other gear. A modern compact furnace for a single family home can readily fit into a small closet. However, care must be exercised to provide adequate ventilation as the exterior of the furnace unit emits a significant amount of heat, and a natural gas or any other fueled furnace will need an adequate amount of combustion air. A garage should never be used as a furnace room for a number of reasons. Air leakage around the connecting ductwork and other needed passages could act to transport potentially dangerous contaminants (including carbon monoxide) from the garage into the main body of the house, ductwork and other passages between the garage and the living areas of the house could be breaches of the required fire resistant barrier between these two areas, a furnace or other such appliance would need to be protected from potential vehicle impact by bollards or some other means, and any ignition source in a garage is required to be at least 18 inches above the floor level due to the potential of explosive gasoline vapors in any garage. In the picture, the airflow is from bottom to top, with an electronic air filter on the bottom, followed by a natural gas high efficiency or condensing furnace (98% efficient) in the middle, and air conditioning coils on top.